Welcome to our website! We hope these pages will give you a small glimpse into our life in Brazil as we settle in and experience the joys and challenges of entering into full time ministry. We are excited about how God has already led us to this point in our lives, and how He is guiding us as we begin to develop a vision for Refúgio (a Biblical Counseling and Leadership Center) with a team of pastors. We believe that in the next few years we will be able to help build up a thriving ministry at the Center to address a number of issues faced by church members and leaders..
We moved to Brazil in June 2009, and after almost two years of setting up a temporary base at David’s parents’ place in São Paulo, we moved into a small apartment in Mogi das Cruzes, the city where the Refúgio ministry is located. Check out the Ministry page to learn more about Refúgio and IPP, the church plant that we are involved with. If you feel led to partner with us, please refer to our Support page to find ways you can pray for us and contribute to our ministry. To keep updated with prayer requests, support status and our general lives and activities, check out our News page. 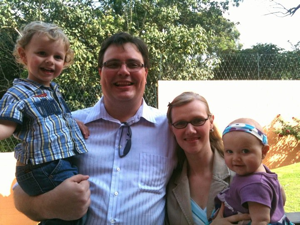 David and Taara Portela are Canadian missionaries, affiliated with World Outreach Ministries, serving the Lord in São Paulo, Brazil through a Biblical Counseling and Leadership Center. They are blessed to be the parents of Lucas and Elena.